First of many (I hope) posts about my favourite topic… MOTORBIKES! Besides working with the Ministry of Health to (I hope!) make a difference, one of the things I was particularly looking forward to was exploring the country on a motorbike during my spare time. Yes, the Long Way Round / Down style! Short UNICEF clip of the Malawi episode here. Not the finding I was hoping for to say the least! However, inspired by the timeless quote by Commander Taggart (aka Tim Allen) in Galaxy Quest: “Never give up. Never surrender!” I shall keep googling and see what other options exist. Gareth did manage to buy this beautiful Honda XL125 in the end. So there is hope! For now, Charley and Ewan will have to wait a bit before riding with me. 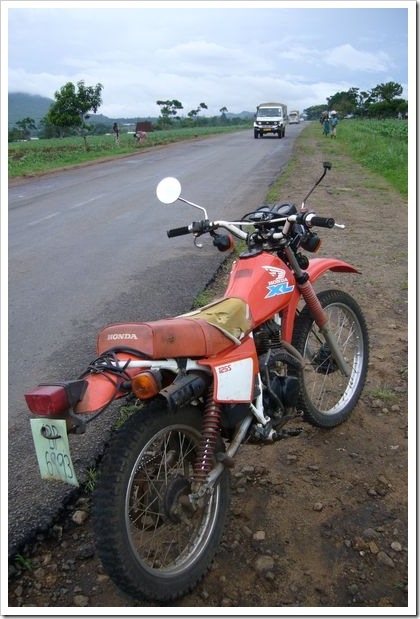 Beginning in August I will be assuming a year-long post with Partners in Health in Lisungwi, and am hoping to obtain a motorcycle to enable a bit of mobility. I’ve really just begun to collect info and shop, and was wondering if you might have any relevant info regarding your experiences. Anything you could pass along would be much appreciated. Pop me an email via about.me/hermanfung and we’ll discuss!